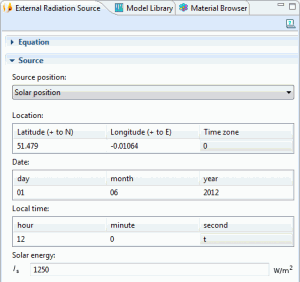 As of version 4.3 of the COMSOL Multiphysics® software and add-on Heat Transfer Module, external radiation sources can be defined in 3D for all physics user interfaces via the Solar Position option. You can easily define the direction and intensity of the sun’s incident radiation based on the latitude and longitude position on Earth, the date, and the time with this new option. (The solar position is only based on the position on Earth, not any other planet or the moon, but it is fine for airplanes and might work for a satellite orbiting close to Earth). So long, dense meshes! Thin walls can now be represented as interior boundaries instead of having to define a solid domain with a wall boundary condition on both sides. A wall condition can be defined between two fluid domains with the Interior Wall boundary condition, which is available in the Conjugate Heat Transfer and Nonisothermal Flow interfaces. To read about more updates to the Heat Transfer Module, check out the 4.3 Release Highlights page. 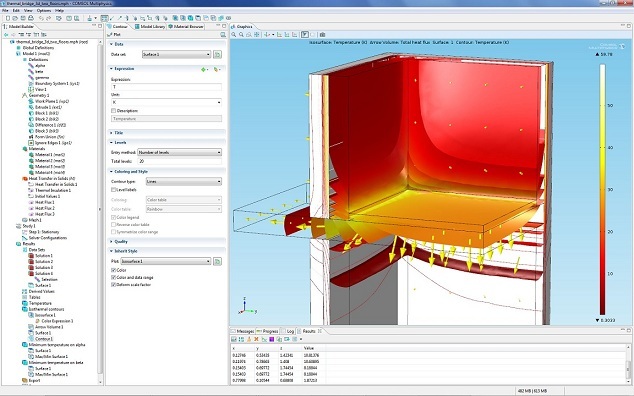 In my conversation with Nicolas, he mentioned in passing that our software had been submitted for a benchmark some time ago for version 3.5, and COMSOL Multiphysics was the only “general-purpose software” to pass the standard EN ISO 10211 for simulations of thermal bridges in buildings. Pretty neat. Is there any app or case to show how to use the sun’s radiation and thermal effects in designing “green” buildings? While the app is originally set up to analyze the effect of radiation on two coolers under a beach umbrella, you could modify it to instead include a building.